The little town of Heiligenblut in Kaernten is the doorway to one of the most famous mountains in Europe, the Grossglockner. An small old town which is these days a little preoccupied with tourists, offers this splendid sight of the mountain. Mostly at this time of the year the peak of the Grossglockner is hidden in clouds, so you have to have a little luck to see it. A good idea is to try this in the morning, the chances of a view are much better. Heiligenblut is a good starting point to visit the Grossglockner itself, driving the Hochalpenstrasse with many exciting views. You can also start several hiking tours from there. 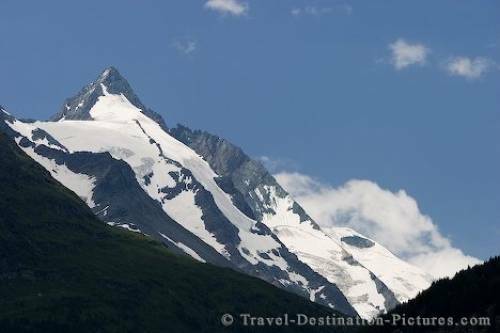 Picture of the stunning and seldom seen peak of Grossglockner in Austria, Europe.